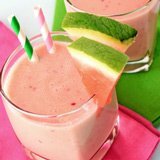 Cantaloupe may not be a fruit that you associate with smoothies, but I can assure you that cantaloupe smoothies are delicious, and banana cantaloupe smoothies doubly so. These melons have a very delicate flavour, unlike berries, which are very sweet. 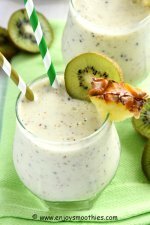 They are also amazingly refreshing in summer, so when you combine them with bananas, you get a wonderfully creamy smoothie that is cool and fruity. 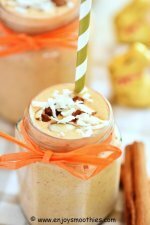 If you want to keep it simple, just stick with the cantaloupe and bananas and perhaps flavour it with some cinnamon or a hint of vanilla. 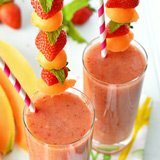 But if you want to go all out, the good news is that you can add almost any other fruit, from berries, other melons, pineapple and mango. The delicate flavour of the cantaloupe won’t overpower the other fruit, in fact you have to be careful that the other flavors don’t overpower the cantaloupe. A delicate balancing act is required. 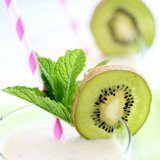 Sometimes the simple things in life are best and this smoothie may only consist of three ingredients but it is amazingly scrummy. 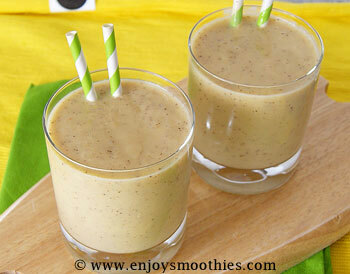 Place the banana, cantaloupe and almond milk into a blender and blend until all the ingredients are processed and the smoothie is thick and creamy. Cut a cantaloupe in half, then in half again. Remove the seeds and skin and cut into chunks. 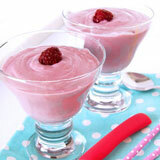 Place into blender, together with banana, frozen raspberries and apple juice. Blitz until smooth and creamy. You will need about a quarter of a cantaloupe. Peel, deseed and chop your cantaloupe. 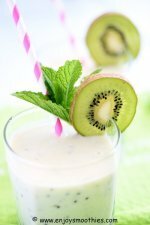 Peel and slice the kiwi fruit and add to the blender, along with the chopped cantaloupe, banana, yogurt and apple juice. 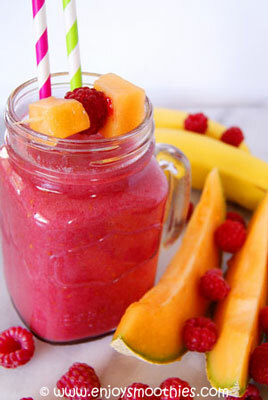 Start with the blender on low until the fruit is chopped. 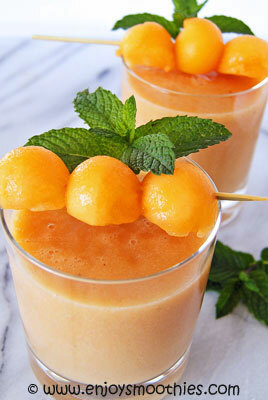 Turn up to high and blend until your smoothie is smooth and creamy. Pour into 2 glasses.